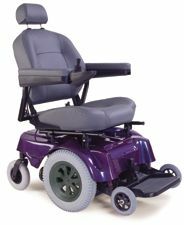 The new Pride Go-Chair is the innovative new design in transport travel electric wheelchairs. Complete with the solid backing of the Pride warranty, the Go-Chair offers the ultimate in take-apart transportability and comes standard with a fully padded seat with armrests. 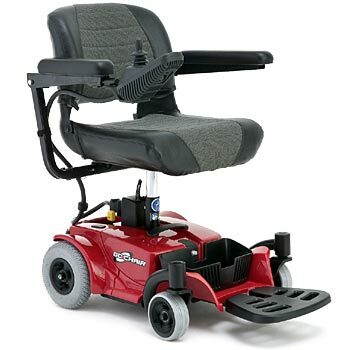 The 22.5" turning radius gives the Go-Chair the ability to maneuver in the smallest spaces...even narrow mobile home hallways!! The Go-Chair is easy to disassemble with no tools and the heaviest piece is only 36.5 lbs.! Solid tires are standard and the seat sits higher than most travel hairs, making room for taller riders. Easy to remove battery pack and compact, light weight frame. Conveniently disassembles into four manageable pieces with heaviest piece weighing only 36.5 lbs. Fits into most vehicle trunks. Padded arm rests and sturdy black nylon upholstery. Range of 10 miles on full charge. Flip back, height adjustable arm rests. Charger 2 amp, separate unit.